There’s nothing quite like a good, useful map. Today, using online maps is an easy and engaging process. Making your own online maps is not a big undertaking anymore; we have at our disposal a wide range of available online mapping tools, from free and simple, to feature rich and complex to use. 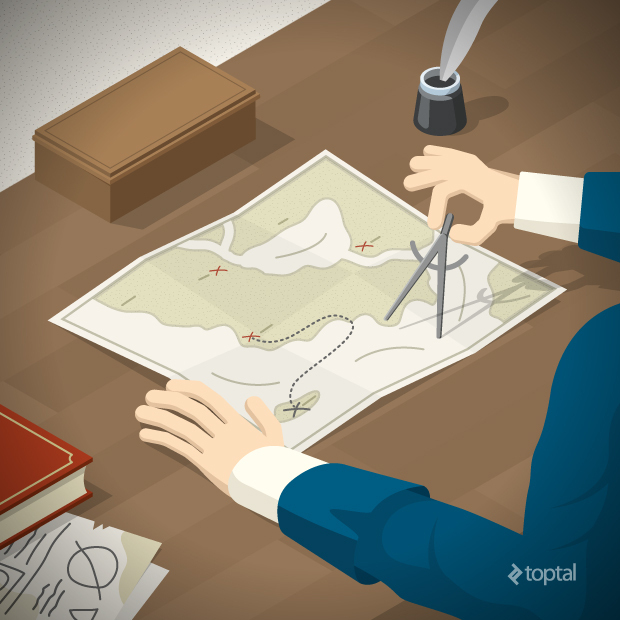 For web developers not familiar with web mapping, the agony of choice might be intimidating. You want to make maps, but don’t know where to start nor which tools to use. I am here to help with this list of the best mapping tools. 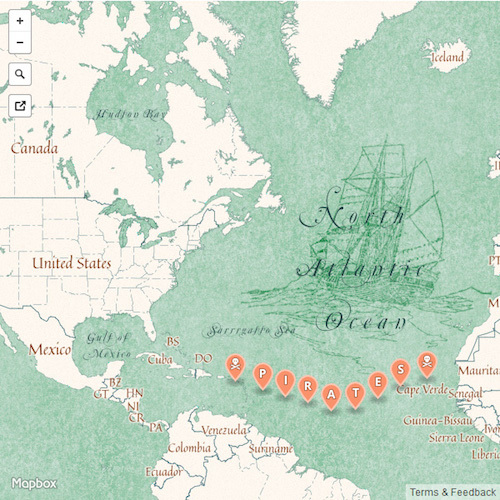 From its beginning, technology has had an influence on mapmaking and how maps are used. As technology progressed, cartography and mapmaking processes evolved with it, from manually drawn maps on papyrus to interactive maps on the web. The second half of the 20th century was a turning point for cartography. Computers became a tool of choice. Aerial photography, satellite imagery, and remote sensing changed the way spatial data is gathered. Geographic Information Systems (GIS) were born. Eventually, GIS maps started moving from the desktop to the web, and big GIS vendors started making the first frameworks for online maps. But GIS mapping is not easy. It requires many server-side technologies, geospatial standards, and protocols, along with their implementations. It requires understanding geospatial data and map projections, knowledge of how to gather the data, how to display the data, which colors to use, how to generalize the data to specific scales, how to place labels on the map, how to set up a server that will serve the maps, how to use a spatial database, and so on. GIS is full of abbreviations, such as WMS, WFS, EPSG, CRS, SLD, GML, TMS, just to name a few, and to know and understand them, you need to read books, academic papers and articles. The first web maps typically showed only a single, very small map image. At that time, panning was implemented by moving one step, usually by half of the map size, in one of eight possible compass directions - N, NW, W, SW, S, SE, E, NE. After the user clicked the pan or zoom button, a whole new image would need to be rendered on the map server, loaded over the network, and then processed by the browser. Because of the constraints of the technology, maps only occupied a very small part of the whole web page. To get better interaction, early maps required plugins like Flash or propriety plugins based on Java, or even ActiveX, which worked only in Internet Explorer. Suddenly, online maps become popular; to add a nice-looking map to your website, you no longer needed to be a cartographer, or a GIS specialist. On the wings of the “Web 2.0” movement, and building off modern technologies like HTML5, CSS3, and SVG, that enable easy creation of interactive content, interactive maps are now living a new renaissance. As mentioned before, early online maps were based on sets of GIS data and their spatial geodatabases. Not many people had access to that data, not to mention its price tag. Google and the OpenStreetMap (OSM) project datasets changed that. Google’s database is private and comes with restrictions, while OSM was inspired by the concept of Wikipedia, as a collaborative project to create a free map of the world. OpenStreetMap is built by a community of volunteer mappers, who contribute to and maintain the spatial data. In short, the biggest revolution that contributed to easy map-making today is that the trouble related to maintaining a map server and the spatial database has been removed. Let’s take a look at some examples from each of these categories. Here, I’ll discuss several of these online mapping tools, providing a brief overview of each, along with code examples, and weighing the pros and cons. We also wrote a D3.js mapping tutorial that you might find interesting as a separate read. To help you pick the right API, Google developed an API picker. It is worth noting that while the basic APIs are free, there are some limitations imposed. The first is that maps must be freely and publicly accessible to end users. Second is usage limitations: the service is free as long your site does not generate more than 25,000 map loads each day, over any 90-day period. If you need larger scales or want a private map, or you are running an enterprise or commercial website, you should consider paying for Google Maps API for Work. 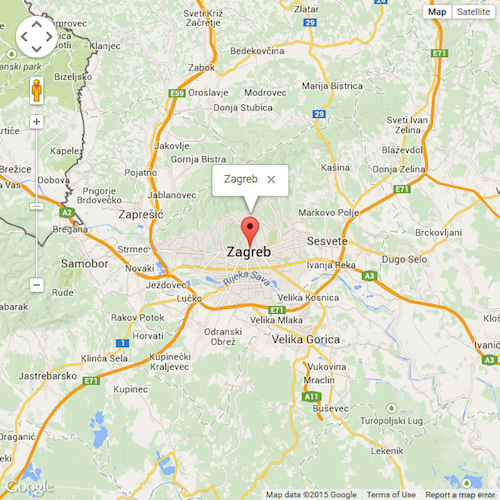 Here’s an example of how to implement a simple Google map in code. It shows how to create a simple map using the API, place a marker on the map, and open a popup with a mouse click. Developed and maintained by Google. Lots of different APIs for including a map in your website or application. Very good API documentation, with lots of examples. Are we sure that we won’t see adds at some point? Everyone is using it; all maps (mostly) look the same. No plugins beside those officially developed by Google. Unclear pricing for Google Maps for Work. This was the major reason for a comprehensive rewrite of its library. The goal was to target the latest HTML5 and CSS3 features, with the same functionality from OpenLayers 2, such as support for projections, standard protocols, and editing functionality. The main focus was on performance improvements, lighter builds, prettier visual components, and a better API. This much-improved OpenLayers 3 was published in August 2014. Let’s see how same map as in the previous example, this time using OpenLayers 3. Feature-packed library for your mapping needs. Support for a range of data types and GIS standards. Built-in support for map projections and editing features. Version 3 is still in heavy development, and the API is still changing with every point release. Version 3 documentation is currently not as thorough as it could be. It is safe to say that Leaflet was born as a reaction to OpenLayers’ bloat, clutter and complexity. Vladimir Agafonkin was asked to build a wrapper around OpenLayers, but he instead created a simple and lightweight OpenLayers alternative, and in May 2011 Leaflet was born. Vladimir focused on simplicity, performance and usability for this online map tool. The core library has only basic functionality, which is enough for most real-life use cases. Still, Leaflet can be extended with a huge amount of plugins that are easy to develop and add on top of the core library. Additionally, Leaflet was developed from scratch with mobile support in mind. Leaflet is easy to use and has a well-documented API, along with simple source code that is available on GitHub. 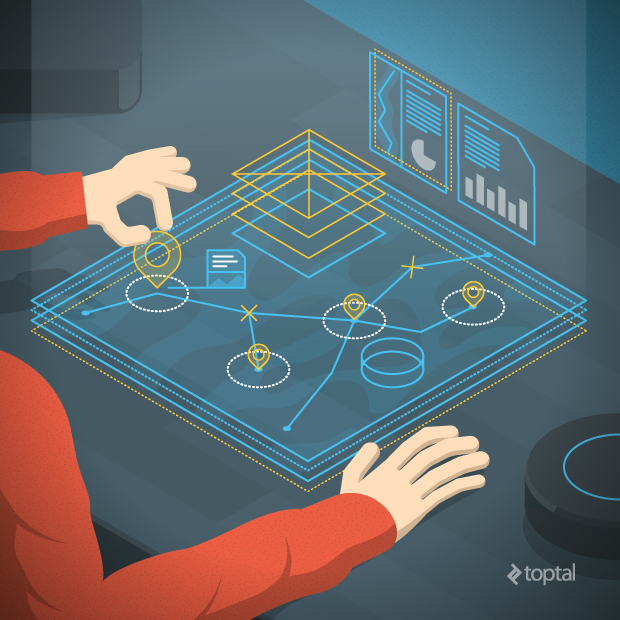 As a result of its focus on performance, usability, simplicity, small size, and mobile support, it is significantly less complicated than OpenLayers. Leaflet’s future is looking interesting, too. According to Vladimir, he plans for the next major release to be even simpler, improving performances further, and upgrading the plugin infrastructure. Here’s the same map as before once again, this time implemented using Leaflet. Simple and easy API syntax. Good for getting an online map up quickly and easily. Plenty of examples with very good documentation. Mobile iOS and Android SDKs. A set of pre-designed maps. Static maps that can be displayed without the need for a mapping library. MapBox offers not only its mapping service, but also access to the data, including privately acquired satellite images, open data from NASA, and community-driven world data from OpenStreetMap. Data styling is done using CartoCSS, a style format created by MapBox, based on CSS and the LESS styling framework. Although the MapBox service offers a free tier, it is limited in bandwidth and storage, and for any serious use the service must be paid for. Many big companies have recognized the benefits that MapBox provides, and are using it on their own sites. They include Foursquare, Evernote, Pinterest, The Financial Times, GitHub, and Etsy, to name a few. As mentioned above, CartoCSS is used to style vector tiles in MapBox. This is done using their MapBox Studio, which is also open source. With MapBox Studio, it is possible to create your own map styles from scratch, or change and extend existing styles created by other designers. Once your custom map is uploaded to your MapBox account, you can embed it on your site using the MapBox API. Take a look at some of the other predesigned MapBox styles here. Big repository of detailed and cloudless satellite images. Beautifully-designed maps out of the box. 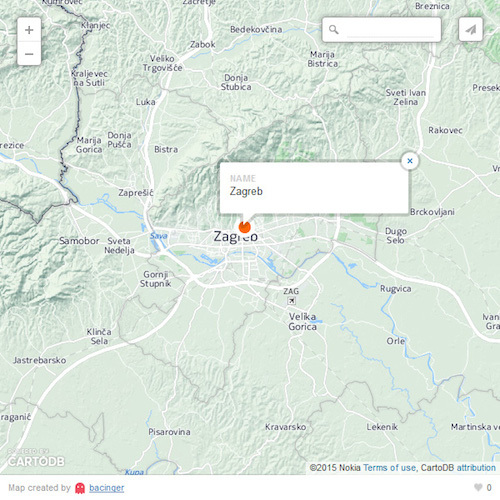 Graphical interface for styling and customizing existing maps. The goodies are not free. Pricing is based more on traffic than features. For more complex geospatial data visualization and analysis, CartoDB is one of the best tools out there. It’s a cloud service that stores geographic data in a spatially-enabled database in the cloud called PostGIS, providing tools to access the data, analyze it using the spatial and geolocation powers of PostGIS, and display it using Leaflet. CartoDB was created as a result of a lack of alternatives for easy geospatial data visualizations and storage. Consequently, CartoDB may be considered an alternative to Google’s Fusion Tables. Users may import data sets in various formats, including CSV, KML or Excel tables, and layer them over maps from common sources such as Google, Here (Nokia), or OpenStreetMap. Since all the geodata is stored in a real database, the data can be accessed and queried with SQL, and then styled with CSS. The CartoDB service is offered as “freemium;” users who leave their data open to the public can host their projects at the CartoDB website for free. To store private data, import more than 5MB of data or use more than five tables, users must subscribe to a premium plan. However, to really get a sense of what CartoDB is capable of, take a look their gallery. Great for managing and storing geospatial data. Supports lots of data formats and large datasets. Based on proven open source products, such as Leaflet and PostGIS. Pricing is based on the stored data size, which can get expensive if very large datasets are used. These are the most popular mapping frameworks currently available, but there are other lesser-known options in the wild. If you are tied to the Microsoft ecosystem, they offer an API similar to Google Maps called Bing Maps API. And, we cannot go without mentioning a dinosaur in the online mapping world, MapQuest. It is still around and offers MapQuest Mapping Tools. If you are looking for a slightly different approach to map making, Kartograph is interesting because it was created with the needs of designers and data journalists in mind. All these frameworks offer a way to customize the style and appearance of your maps. MapBox and CartoDB offer styling using CSS or a variation of CSS. On the Google front, version 3 of the Google Maps API introduced custom styled maps. This finally allowed developers, especially designers, more room to customize the default Google Maps design seen everywhere, and bring it more in line with a website’s overall visual theme. Within the rich Google Maps community, a few styling resources have been born. The most notable is Snazzy Maps, a community of people creating custom styles for Google Maps and sharing them free of charge. If you decided to go with OpenLayers or Leaflet, then you are limited to pre-rendered map tiles. Fortunately, there is a different range of map tiles to choose, from Google, Nokia, Bing or default OSM tiles, to those specially created by designers, such as Stamen. To get a feeling how many available map tiles exist, or how they look compared to each other, visit the Streetmap Smackdown or Map compare sites. Vector-Only - Using vector maps instead of raster images with D3.js brings a new world of features that are not possible using standard frameworks. MapBox is also moving in this direction, with MapBox GL, based on OpenGL. 3D - Three dimensional terrain and buildings are now showing up in maps, and OpenLayers v3 ships with built-in support for Cesium. Each of the best online mapping tools listed here has its strengths and weaknesses. For example, the code examples show the simplicity of using Leaflet, versus the complexity that OpenLayers brings. But Leaflet won’t solve your complex spatial problems where OpenLayers will. The choice comes down to what your needs are. Google Maps - Well rounded, established mapping solution, especially for non-developers to get a basic map on the web, along with all the powers that Google is (in)famous for. OpenLayers - For situations when other mapping frameworks can’t solve your spatial analysis problems. Leaflet - Currently, easily the best mapping framework for general mapping purposes, especially if you don’t need the additional services that MapBox or CartoDB provide. MapBox - Fast growing and market changing mapping solution for when you want more control over map styling or have a need for services that others are not providing, such as detailed satellite images, geocoding or directions. CartoDB - If you have heavy datasets, stored in different data formats, look no further. Check MapTiler (http://www.maptiler.com/) in case you want to display your own raster maps, such as a scanned paper map, an aerial photo or a shot from a drone, or some of the open geodata available online from the government. It runs with Leaflet, OpenLayers as well as Google Maps. Even if you choose to go with Leaflet, you can customize your map. It takes quite an effort to do so, as you need to set up your own tile server (PostGIS + Mapnik), which is a pain, but it's definitely an option. Might I add the tt graphics help the article a good deal. Hats off to your design team! Except the first two graphics, others are maps that you would get if you run the provided code examples. I was referring to the first two illustrations - I understand the others are example interactive map implementations. I've tried MapBox geocoding API and it doesn't work as I'd like it to :( any good alternatives to Google Places API? Thanks for the links...will try them out. BTW, the point about sites using Google Maps must be "freely reachable", does this mean any kind of webapp with a private login (so not available for anyone but only for select users) would violate this? We developed a web app for a company which is not open but needs a login etc and were considering Gmaps but in the end went with Leaflet (most due to simpler API). Guess this was even a wiser choice then? The T&C of all company developed maps (Google and Bing) are so complicated you never really know if you are using the maps with the proper permission or not (or maybe it is just me ;). Hi Tomilav, I would like to know your opinion on what kind of app will do for my case because I'm not a developer. I'm working with an ONG who needs to create a mapping for donors in their page. I tried a pilot with our datebase in Google My Maps, the only problem I found is that the map doesn't have anb option to actualize the map with the data you import from a spreadsheet. We would like to have in our page an interactive map, with comments and photos but we need to be able to keep actualizing it without redoing the map each time. Our datebase is simple. What Mapping Tool would you recommend for us? Thanks a lot!! I need to create a web page that has a database of around 250 locations around the US. An anonymous user would enter their location and the app will display the five nearest locations in the database along with the driving time and associated contact info (phone number, address, hours of operation, etc.). The user would select the desired location and would be presented with driving directions to that location.The database would be fairly static except for periodic update. Which framework would be best for this application? It works, it's very easy to use, and it's cool. However, it's not free — the 'trial version' will put watermarks on all the tiles and also limit them to a certain degree. An alternative is using GDAL2Tiles. It's easily available for most operating systems, but it's unsexy — a command-line tool. Here is an article by Pedro Sousa explaining how to use it to generate tiles: https://build-failed.blogspot.pt/2012/11/zoomable-image-with-leaflet.html He uses Leaflet to show the tiles, but I'm pretty sure this could be used with other frameworks as well. That's a great article! Any change to get an updated version 3 years after? If you need to make a choropleth map check out : http://coloredatlas.com Its totally free.